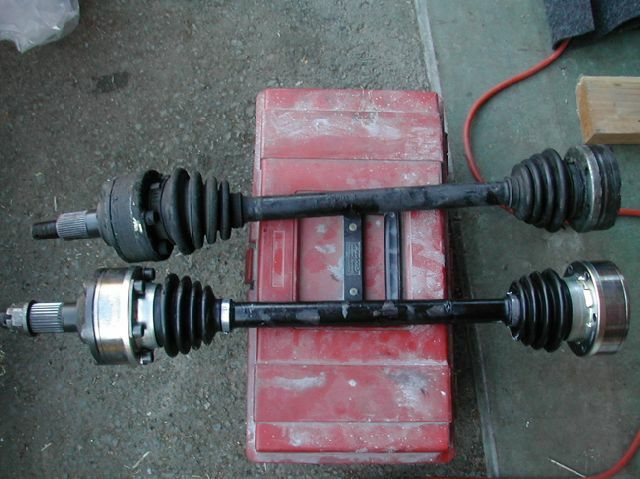 This Article describes how to convert the rear axles on your 914 to give you real 5-lug hubs using a mix of 914, 944 and 911 components. 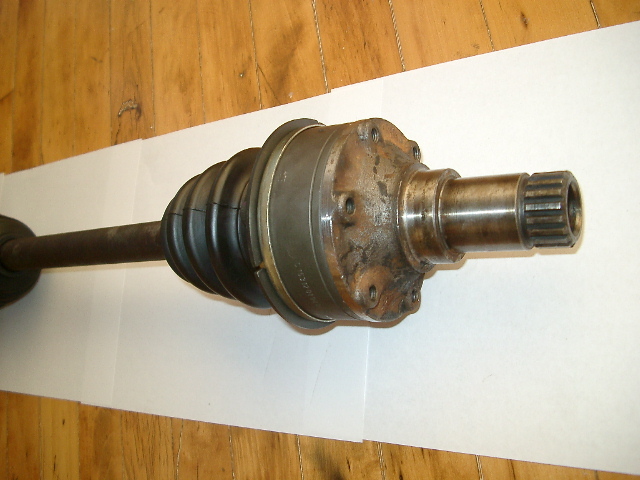 Remove the CV joints from your old axles and machine both ends of your axle shafts to allow the wider 944 CVs to slide on. You'll have to remove 4mm of material to make up for the wider 944 CVs. 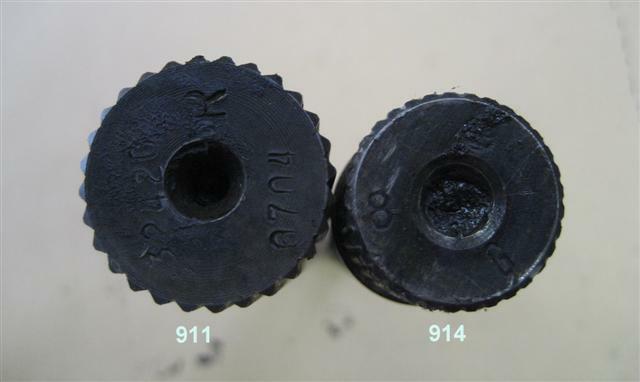 Grease up your new 944 CVs and slide them on the machined axle shaft *without* using the stock spring washer behind the CV! Make sure the CV slides all the way on and don't forget to put the circlip back onto the shaft to prevent the CV from sliding off. Note: Make sure the "groove" on the outside of the new CVs always points away from the axle (see picture with the complete axle). Remove the old stub axles and hub. Remove the old wheel bearings. Install the new wheel bearing in your trailing arms. 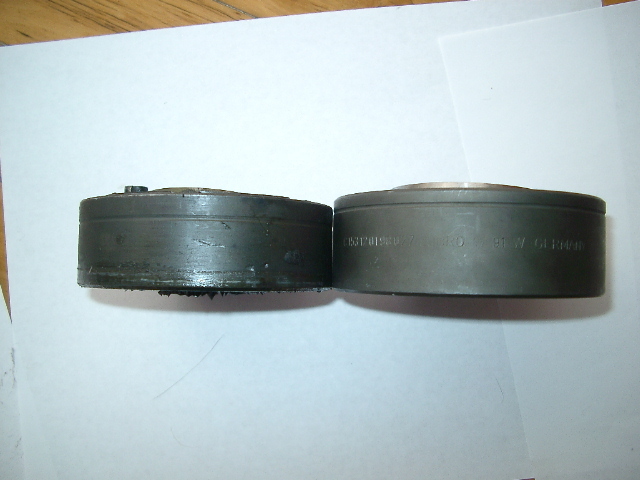 Make sure the bearing surface on your new hubs is clean and press in the new hubs. Install the new stub axles and tighten the axle nut. 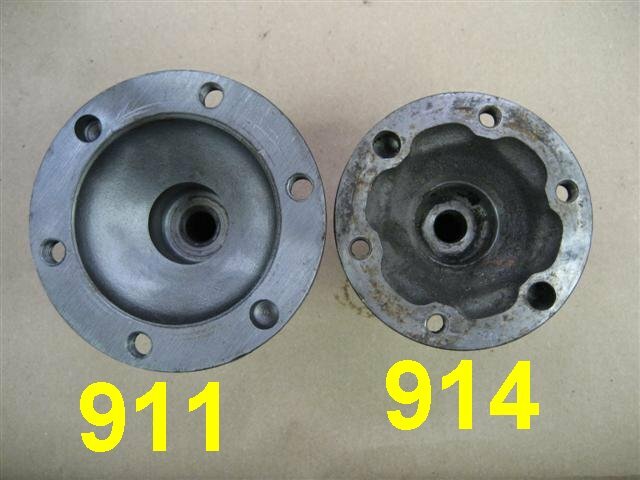 Remove the old output flanges from your transmission, replace the seals and slide in the new 911 flanges. 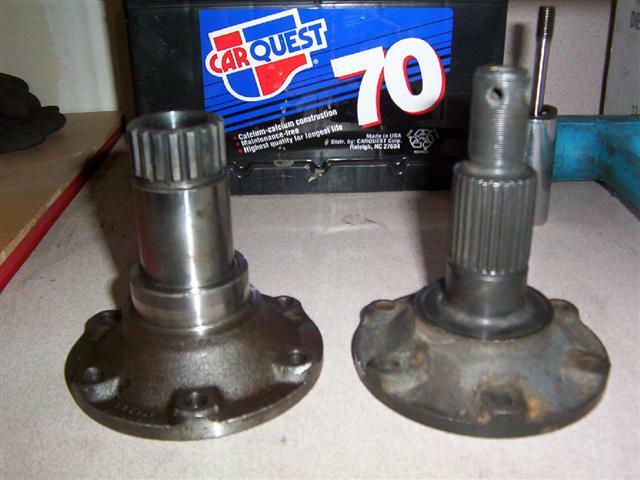 Grease up both, the output flange cup and the stub axle cup and install your new axles. Don't forget the CV seals! Tighten everything to spec and enjoy! did i miss something ??? Congrats, this is a great post ! Yes...when are you going to start selling these to those of us who are incapable (or lazy)? Andy, can you tell me why this is better or more beneficial than the other 5 lug conversions that are on threads here? Thanks. Because you don't have to re-drill a 4 hub. Let this go a few days and make all the edits you want Andy and get it all correct. Then I'll create a tech article. Thanks for the write up. I will probably be using this exact method on my car. I do have a question. I don't understand the differences in the various transmission output flanges. I am assuming that the course (33 teeth?) flange you mention works with 901/914 transmissions. Does that also work with early 915 transmissions that I think also used a course flange? I think that later 915 transmissions used a fine (43 teeth?) flange. Will this later 915 flange work with this setup? I would like to do exactly as you have described, but with my 914 transmission today and then in the future switch to a 915 transmission with hopefully the only potential change is in the output flange. 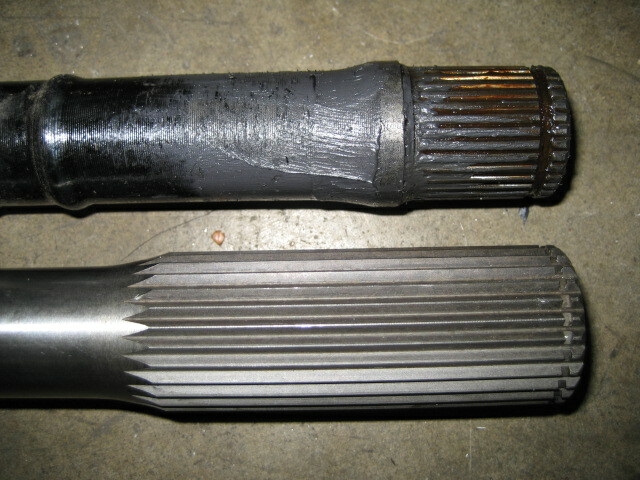 I'd add part #'s for the new parts, and spline counts for the output shaft, hubs and stub axles. Also, when machining the drive shaft, how big of a radius can be left on the inside corner (you do not want to have a sharp corner there), and I think I would also round the outside corner so as to remove the sharp edge. Do you require Schnorr washers as well? (IMG:style_emoticons/default/agree.gif) It would be helpful to list the actual part numbers under "Tools and Supplies." Looking forward to using this info in the near future. Can I get this one dad?? How does this affect the issue with the parking/emergency brake? I understand that the 911 conversion negates the use of the parking brake; does this have the same problem or is it a non issue based on the fact that your not changing out the entire suspension. Uneducated minds would like to know. I believe that e-brake issues are more of a function of moving away from the stock 914 rear caliper than a five lug conversion issue. For example you can do a five lug conversion and use a 914/6 rear caliper ($$$$) as the e-brake solution is the same for all 914 (4 or 6) calipers. But it is common to do a five lug conversion and at the same time move to a 911 (or other) rear caliper that uses a different e-brake solution than the 914 rear caliper does. I'm going to add a few things here so that it can be found when searching. 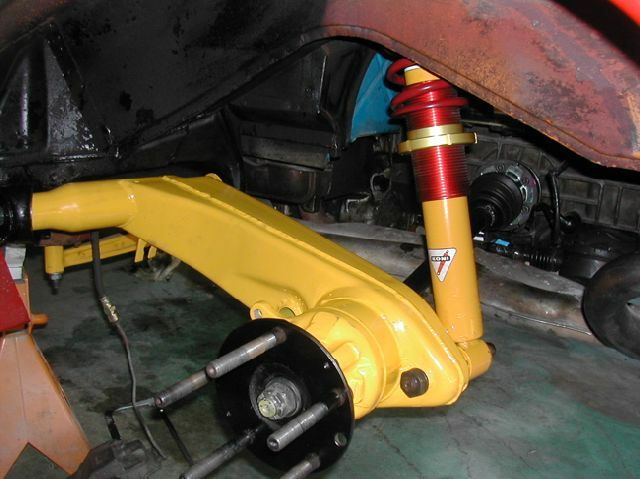 Andy's method is a great and economical solution for the wimpy 914 CV's. If you are running big horsepower and large sticky tires you "can" go even bigger. It will cost a lot more though. This mod has nothing to do with brakes. That would be another topic. 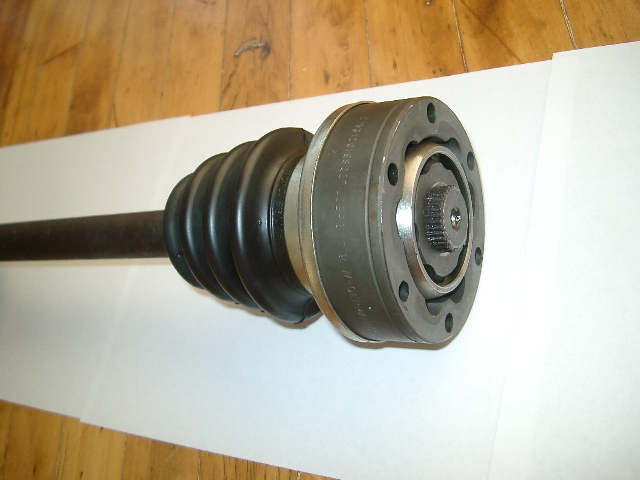 One BIG benefit is that you can still buy NEW 944 CV joints, and they should hold up better with more power. One can still use 4-cyl rear calipers with 914-6 rear rotors, or one could have 4-cyl rear rotors drilled for 5-lug. Please post Part numbers of the transmission output flanges as these seem to be the item I have the greatest difficulty in obtaining. OK, got it. My assumption is, correct me if it is wrong, that if I were to do Andy's conversion I would have to re-do the rear brakes or would the stock 914/4 system work with this conversion? Understand the stopping power is reduced with bigger wheels but if your not racing the car or increasing the power is it required to convert the brakes? I am still a novice at this so am trying to learn as I go along. 2. CV bolts should be replaced with longer ones to match the 944's wider width. It may be recommended to use grade 8 bolts that allow safety wire. At least, locktite the bolts. 3. 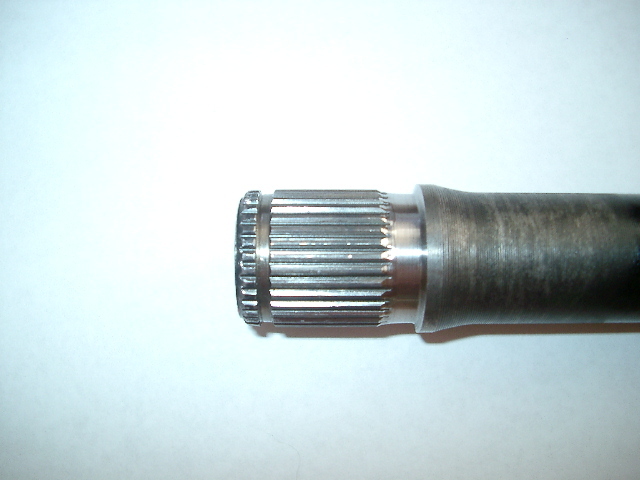 For us newbies, the 100mm reference is the outside diameter of the CV, not the bolt circle. Of course, that's if that's correct. OOPs, I obviously missed that.